Capacity at 12V: 50A. with resistance. Inductive Load [A]: 46. Capacitive Load [A]: 44. Ohmic Load [A]: 50. 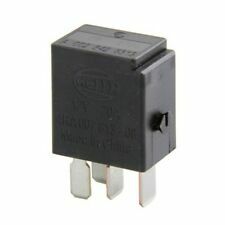 Plug Type ID: B3. A 002 542 88 19. A 002 542 87 19. Hella Part Number:4RA007793-07. Good Working Order. Condition:Used and Good Working Order. C-CLASS Estate 1996-2001. E-CLASS Estate 1996-2003. 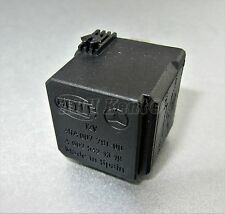 Tyco Part Number:Tyco-A1001-X42. Good Working Order. Condition:Used and Good Working Order. CLS 2004-2011. VANEO 2002-2005. SLK 2004-2011. Hella Part Number:4RA007791-00. Good Working Order. Condition:Used and Good Working Order. Hella Part Number:4RA007794-00. Good Working Order. Condition:Used and Good Working Order. 12V 10/20A. fits all models from (1995 - 2012). Fits both LHD & RHD cars. Good Working Order. Hella Part Number:077.10. 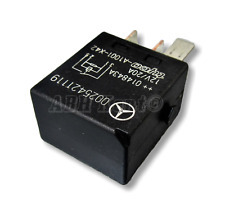 Product type : FLASHER UNIT RELAY 12V N/O 4-PIN 50AMP NO BKT RE. The complexity of electric and electronic systems in vehicles has increased significantly in the past few years. General Electrics by HELLA — WE MASTER COMPLEXITY ". Good Working Order. Condition:Used and Good Working Order. Hella Part Number:4RA940010-69. Made By Hella in Spain. Good Working Order. Condition:Used and Good Working Order. YOU WILL RECEIVE EXACT WHAT YOU SEE IN THE PICTURES. Pictures taken from actual item. 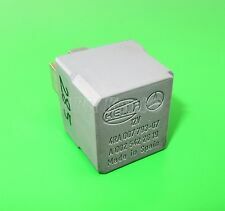 Hella Part Number:4RB007967-00. Good Working Order. Condition:Used and Good Working Order. Made ByHella in Portugal. Condition:Used and Good Working Order. Fits both LHD & RHD cars. Good Working Order. Hella Part Number:4RA007793-10. Good Working Order. Condition:Used and Good Working Order. Suspension Ball Joints. Belt Tensioner Wheels & Bkts. Brake Master Cylinders. Relay function: Pneumatic Suspension. Rear Lights. Colour: Green. Front Exhausts Cats. Estimates can be provided beforehand but prices may differ upon ordering. Condition:Used and Good Working Order. Pictures taken from actual item. Hella Part Number:4RD007814-02. YOU WILL RECEIVE EXACT WHAT YOU SEE IN THE PICTURES. R-CLASS 2006-. M-CLASS 1998-2005. C-CLASS T-Model 2001-2007. BEHR HELLA SERVICE: 351321141. BEHR HELLA SERVICE: 9012938. BEHR HELLA SERVICE: 88523. Replaces following reference(s) Site Safety. Safety & Workwear. (We can mark the item as a 'gift' if requested to, but we will not declare any different amount). Hella Part Number:4RA007813-08. C-CLASS Estate 1996-2001. E-CLASS Estate 1996-2003. Good Working Order. Condition:Used and Good Working Order. CLS Shooting Brake 2012-. CLS 2004-2011. VANEO 2002-2005. Hella Part Number:4RA940010-69. Good Working Order. Condition:Used and Good Working Order. 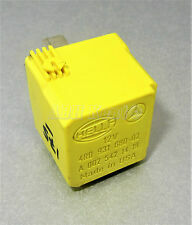 Tyco Part Number:V23134-B52-X321. Good Working Order. BEHR HELLA SERVICE: 351321241. BEHR HELLA SERVICE: 9016768. Replaces following reference(s) (We can mark the item as a 'gift' if requested to, but we will not declare any different amount). Restaurant & Catering. Maybach 2002-2012. fits all models from (1997 - 2012). 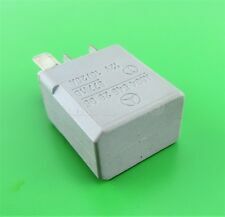 OEM Part Number. HELLA Relay Multifunction, Manufacturer Art. 4RA 933 766-111, EAN: 4082300576108. sku: 4RA 933 766-111. Marke Hella. Inductive load [A]: 2. Capacitive load [A]: 2. Resistive load [A]: 2. 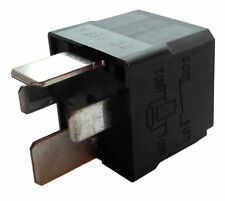 Plug Type ID: C.
Hella Part Number:4RA007813-00. C-CLASS Estate 1996-2001. E-CLASS Estate 1996-2003. Good Working Order. Condition:Used and Good Working Order. CLS Shooting Brake 2012-. CLS 2004-2011. VANEO 2002-2005. BEHR HELLA SERVICE: 351321141. BEHR HELLA SERVICE: 9012938. BEHR HELLA SERVICE: 88523. Replaces following reference(s) (We can mark the item as a 'gift' if requested to, but we will not declare any different amount). 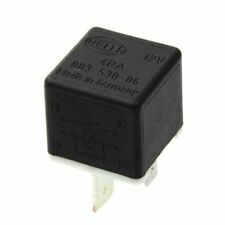 Relay, main current| Relay, glow plug system| Multifunctional Relay - HELLA 4RA007793031. HELLA: 4RA003530021. HELLA: 007793031. HELLA: 4RA003510461. HELLA: 007793038. HELLA: 4RA007793038. HELLA: 4RA003530067.